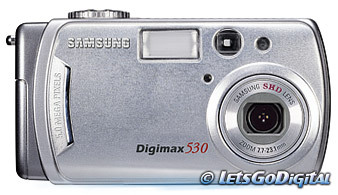 Samsung introduces the Digimax 530, an entry-level 5.0 Megapixel digital camera with an interesting price. A high 5 Megapixel Auto focus digital camera with 3x optical and 4x digital zoom, the new Digimax 530 allows even the casual snap shooter to experience everything the high resolution world has to offer without breaking the bank. With an approximate street price of $279.99, the Digimax 530 has a very competitive price tag. Its 1/1.8” CCD captures sharp and detailed images, and the 1.5-inch TFT LCD with multiple language support is ideal for image preview and review. The Digimax 530 offers many of the same state-of-the-art technologies found in higher priced 5 Megapixel cameras, including multiple flash modes, adjustable white balance and selectable ISO sensitivity (100, 200, 400 and Auto). The camera’s super macro mode allows users to capture sharp and clear images of subjects as close as 6cm from the lens. Digimax 530 users can capture both still images and movie clips with audio, and the bundled USB and user selectable NSTC/PAL connectors allow for easy transfer to a PC. The Digimax 530 has 32MB of internal memory and also has a built in slot for up to 256MB of external SD/MMC memory. The Digimax 530 supports 8 different power sources in AA Alkaline, NiMH, CR-V3 Lithium, Digimax I-Pack, NiCd, 2 x NiZn, 2 x NiMn and optional AC adapter. With TTL Auto Focus, Programmed AE and Metering exposure controls, Normal and Night scene modes, and Single and Continuous shooting, the Digimax 530 screams value as it's packaged with features that would normally draw a higher price-tag in other 5 megapixel digital cameras.